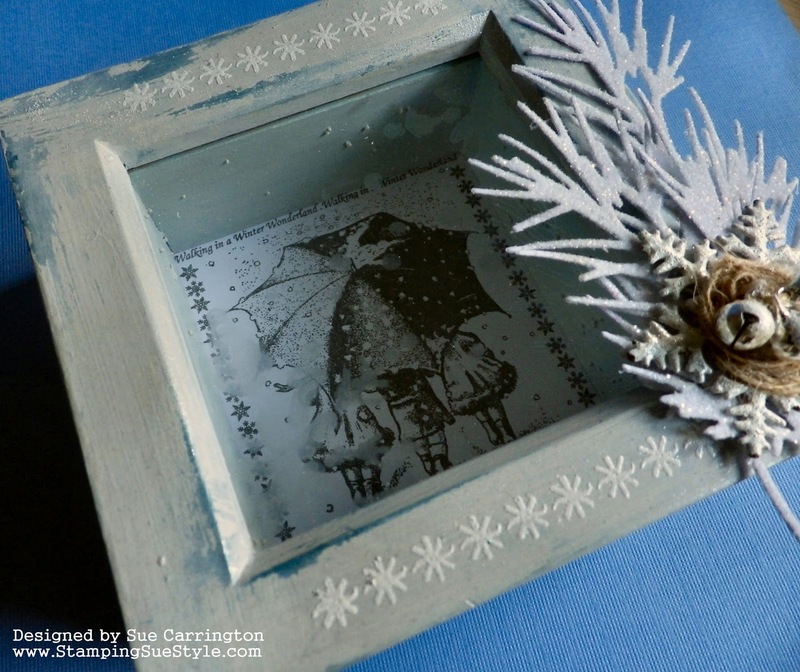 We're starting a new challenge over on the Stamps and Stencils blog and I'm the host. 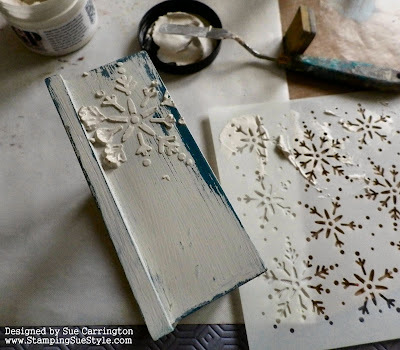 I've kept it easy and chosed Stamps AND Stencils with a Festive theme. The team have made some stunning projects so make sure you hop over there for a visit. I started a small box frame a while ago, decided I didn't like where it was going and put it on the unfinished pile. A suitable amount of time has passed and now the frame has come off the pile and made a reappearance ! 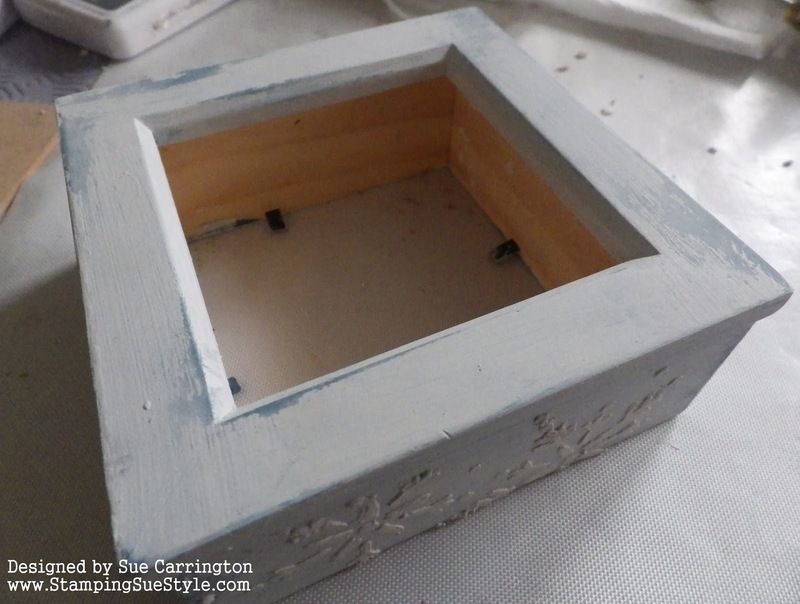 The frame was already painted and I remember I'd smeared Vaseline over parts of it so when the next layer of paint was added it could be wiped away in parts. 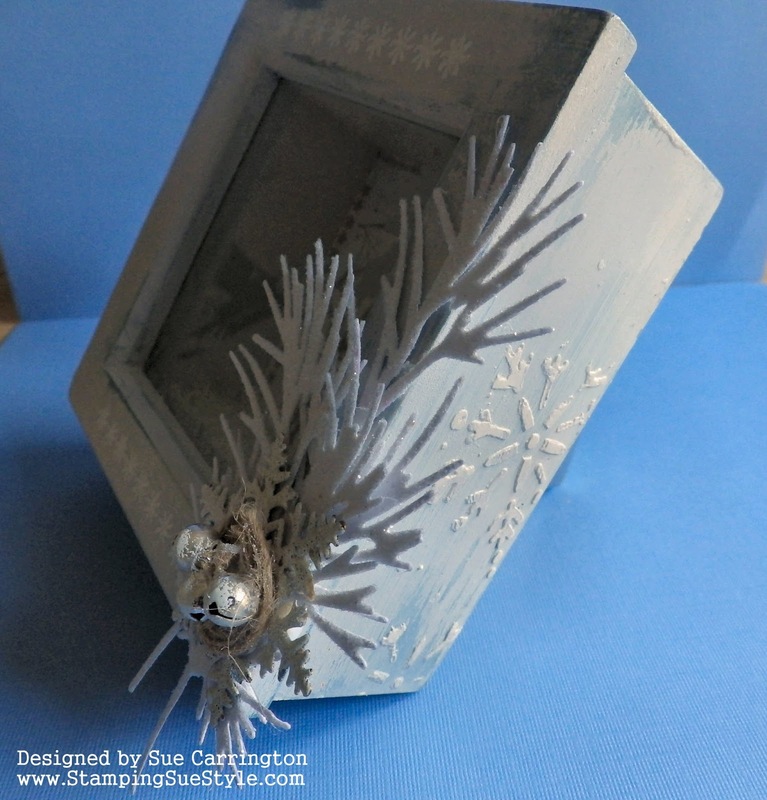 Around the sides I used a Kay Carley stencil with Grunge Paste, it was very messy and although the snowflakes were a little bit blurred I quite liked them ! 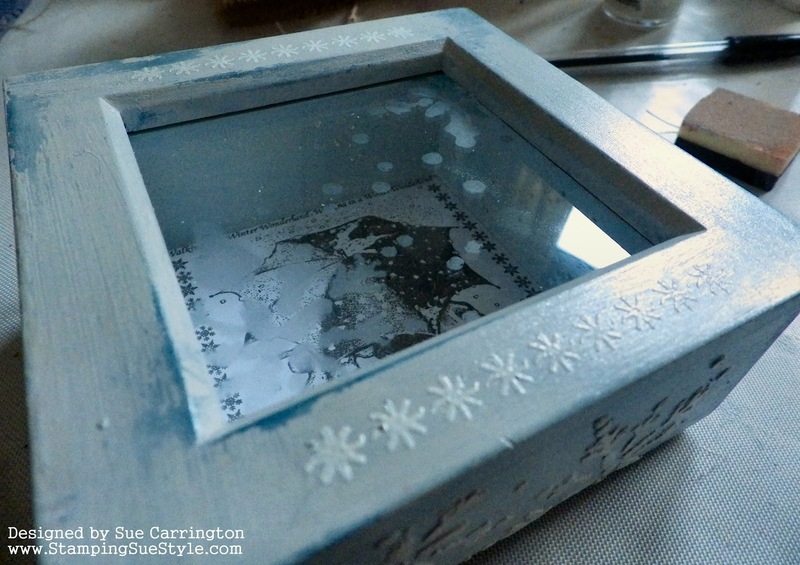 I gave the whole frame a watered down coat of Concrete Fresco Finish paint then I brushed over a coat of PaperArtsy Metallic Glaze. I used a Lin Brown stamp for the row of little flowers top and bottom and I've used white embossing powder. I've also used the Frosting Glaze by PaperArtsy through the Kay Carley stencil on the glass. It was a little difficult to photograph but I think you can just about see it. The stamped image at the back of the frame is by Crafty Individuals, and it fitted perfectly. I've stamped it with Watering Can Archival ink so the image was more subtle. The side view shows how the Grunge Paste snowflakes blended in quite nicely. I found one metal snowflake in my embellishments box and miraculously it was already painted white ! I gave it a coat of Metallic Glaze to add some sparkle. 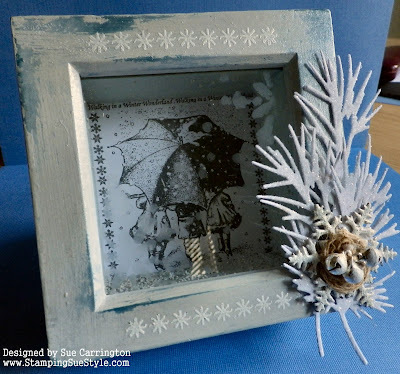 The foliage is cut using a Tim Holtz die and I've used Sticky Powder and some Distress Glitter. 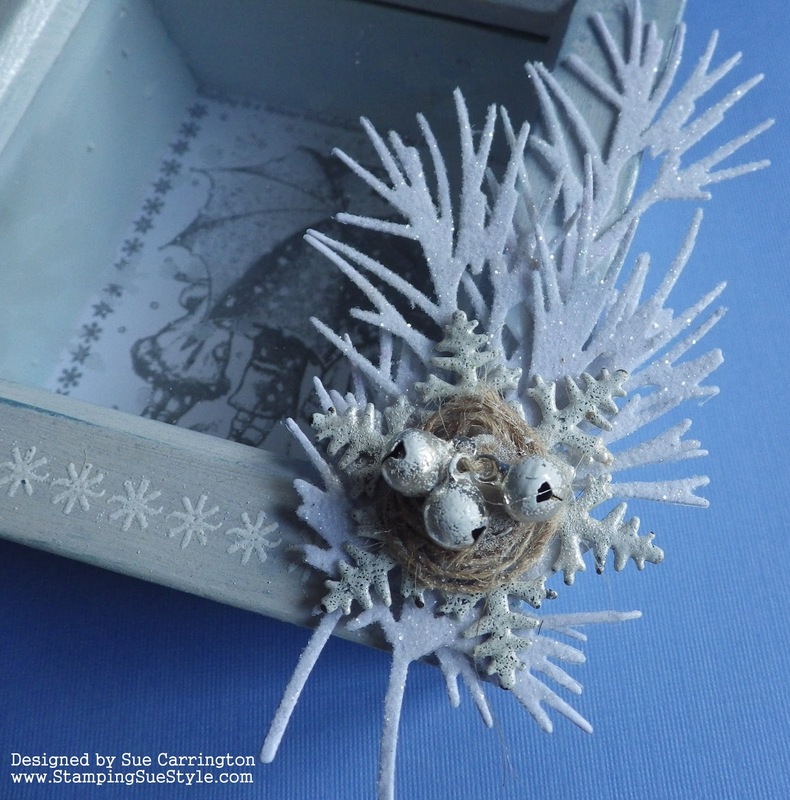 The little jingle bells have been dabbed with Versamark ink then I sprinkled white embossing powder over them. I hope you find time to join us for the last challenge of 2017 and do make sure you hop over to Stamps and Stencils to see the fabulous projects from the rest of the team.